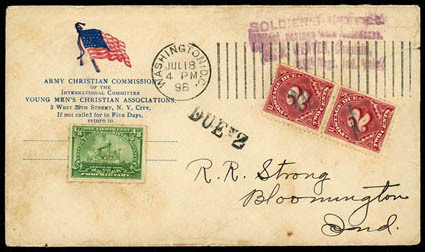 (Spanish American War Patriotic) Washington, D.C. Jul 18 '98, machine cancel on Army Christian Commission patriotic envelope to Bloomington, Ind. with purple "Soldier's Letter, Without postage charge address / Chaplain" handstamp, "Due 2" handstamp and pencil cancelled 2¢ postage due vertical pair affixed, 1898 1/8 proprietary battleship issue affixed in return address portion, Jul. 20th receiving backstamp; small faults, Fine. 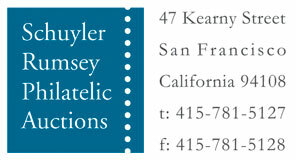 A link back to Sale 75 - Lot 181, along with its description, will be appended to your message.